Dirty Harry versus the Cross-Eyed Webbed Wonder! The 1980s were a truly memorable time for yours truly, as I got a lot of television viewing accomplished in that decade. Oddly enough, you would think that after (literally) thousands of hours of TV viewing all the shows would have meshed together and my mind wouldn’t be able to truly remember anything, but this isn’t the case. As with any medium there are times when something just stands out and you remember it no matter how hard you try to forget. A show like “Sledge Hammer!” falls into this category. I loved that show, it was so over the top and ahead of its time that it still lingers in my admittedly muddled mind. For those of you unfamiliar with “Sledge Hammer!” and too lazy to do a web search on it, the show was a remarkably good prime-time spoof of your typical cop show, and Dirty Harry in particular. It featured Sledge Hammer (yes, that’s his name), a slow-witted, chauvinistic, ultra-violent detective who somehow always manages to solve his cases. He treats his gun better than any human being, routinely shoots first and asks questions almost never. His catch phrase “Trust me, I know what I’m doing” invariably leads to disaster. If you’ve never seen an episode I highly recommend it. Words, particularly my words, do not do it justice. I don’t know about you, but I took a double take when I first saw this issue on the newsstand many, many years ago. Were my eyes deceiving me or was that really Spider-Man firing a gun at Sledge? To my mind I can’t recall having ever seen Spider-Man (or Peter Parker for that matter) carrying around a gun, let alone shooting it at the police. The cover was illustrated by Alex Saviuk, then artist on many Spider-Man titles (Web of Spider-Man comes to mind), so that had to be Spider-Man. And then you read the text boxes and it all the supposition goes to pot. Still, you have to wonder why more fans haven’t caught onto this little gem of a book for the simply insane Spider-Man image it demonstrates. Sure, they say it’s a guy dressed as Spider-Man, but why spoil your fun? Uh, yeah, that’s definitely something you don’t see on a typical comic book cover. And hey, notice how much wordier comics were back in the day? This single issue took me almost a half hour to read. Nowadays you can read an issue in a couple of minutes. Heck, the text on this one page would equal the text of an entire modern comic book in most cases. Okay, what’s up with Spider-Man’s eyes? That’s just creepy. I know that in Amazing Fantasy #15 there’s the one panel where you see Spidey’s pupils (top right), and it works because it conveys how shocked he is after discovering that the man who murdered his Uncle Ben was also the robber he let go earlier in the day. It worked there very well. Uncle Ben – hmm – I wonder what came first, Uncle Ben the Spider-Man uncle, or Uncle Ben the rice mogul? The fellow asking about coffee is, of course, the artist Alex Saviuk, apparently moonlighting as a San Francisco cop. Guess comic artists didn’t make much back in the 1980s. Weird side note, why Commissioner Gordon is here and not in Gotham City is anybody’s guess. Maybe this was on his way to Japan? Okay, it turns out the doorman is an escapee from the loony ward of the prison. Once Trunk and Hammer meet the warden Warden, he spills his guts and reveals the diabolical plan of Commissioner Schmissioner! Seems the Commissioner plans to release prisoners with guns that they’d sell to other criminals, who’d get caught committing crimes, thereby the police would seize the guns, then give them back to the prisoners to sell to other criminals – or something like that. Honestly, I read the damned thing a dozen times and all I got was a headache. Okay, anyone else see something screwy with this? 1) The Commissioner had the Warden’s daughter KILLED to keep him quiet??? How is that supposed to keep him quiet??? What’s the incentive now that she’s dead??? You’re supposed to THREATEN to kill to keep someone quiet. Or you could just kill the warden to keep him permanently quiet and replace him with a crony. So, how do our heroes get out of this mess, you ask? That’s right, the warden remembered that his office was a prison cell that prisoners escaped from all the time and in the next few seconds he just happens to find the trap door in his floor. A trap door that leads directly into a waiting hamper in the laundry room. Let me repeat that, the warden had his office built in a former prison cell that has a trap door in the floor that leads directly to the laundry room that always has a big laundry hamper waiting by. Continuing with the story (such as it is) the swap goes haywire and Sledge and Trunk get caught. Turns out that the warden’s daughter Lucy is still alive for some reason (apparently she’s a pro wrestler so a fall from 41 stories is no big deal to her) and hanging out with the Commissioner and his Spider-Man crony. I guess she has a thing for middle-aged men in positions of power, which makes her now faked death make even less sense than it did before. Hammer and friends route the crooks and Spidey tries to make a break for it! 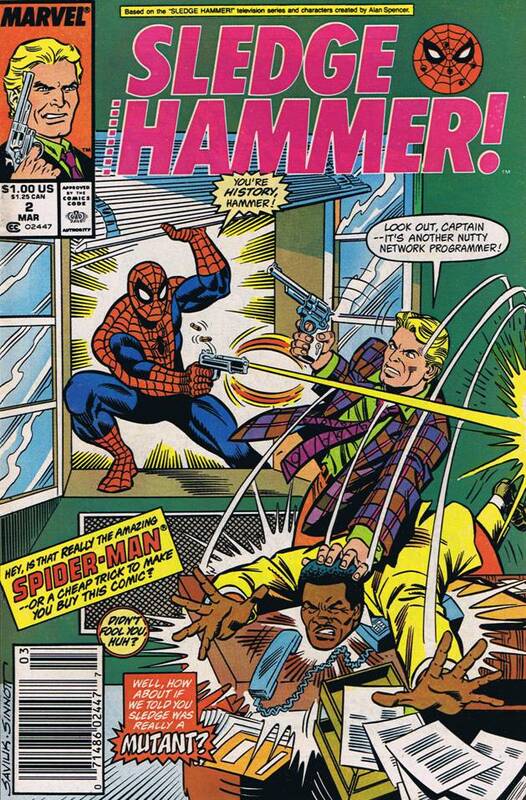 Okay folks, this is what you’ve been salivating for, the big showdown between Sledge Hammer and your Friendly Neighborhood Spider-Man! Oops, my bad, that’s an inappropriately close-up shot of Dori and the Commissioner’s (ahem) nether region. And there you have it folks. An entire issue and I’m still not sure why the goon was dressed as Spider-Man. My guess is the crooks were trying to frame Spidey, but honestly, we all know it was a sales gimmick. Sadly, even with the Spider-Bump this was destined to be the final issue of the ‘Sledge Hammer!’ foray into comics. This series only lasted 2 issues (maybe someday I’ll cover issue #1, right now my brain needs a chance to recover) and like it’s TV big brother, it burned out too soon.